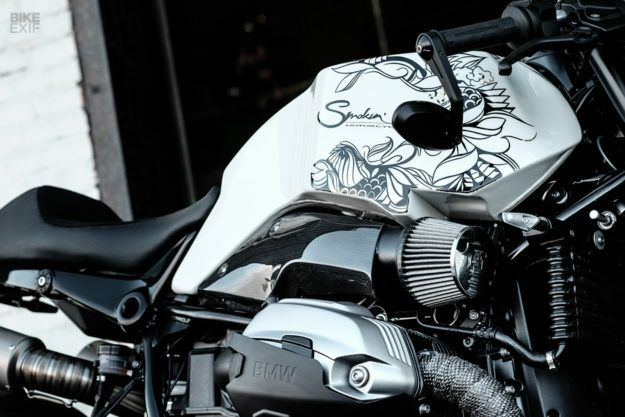 After three years and several cracking custom builds, the Rotterdam-based duo behind Smokin’ Motorcycles are parting ways. That sounds like bad news, but it’s not. Rob van der Heijden and Maarten Timmer aren’t downing tools for good, they’re just not working under the same banner any more. A great partnership deserves an epic send-off. 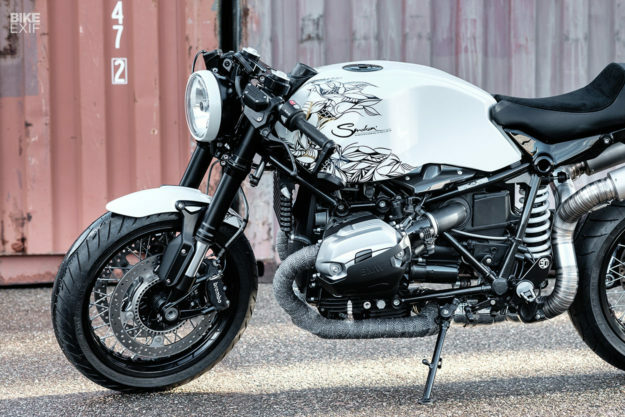 So here’s the last official Smokin’ Motorcycles build: a brawny BMW called ‘Ghost Dog.’ It’s based on the stunningly popular R nineT, which has helped BMW increase its motorcycle sales for seven years in a row. Cinephiles will recognize the name Ghost Dog: it’s a nod to Jim Jarmusch’s 1999 crime flick, starring Forest Whitaker as a hitman who follows the ancient code of the Samurai. 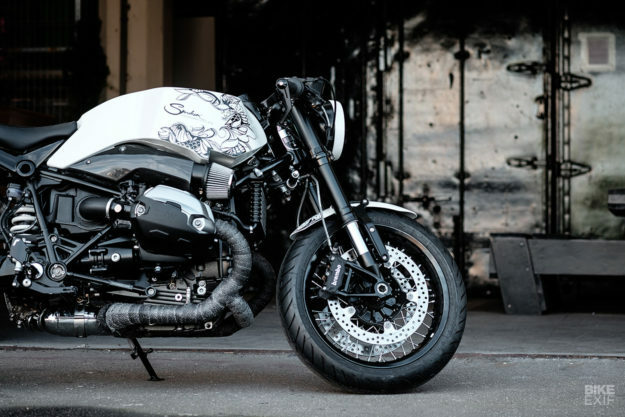 It’s a bizarre connection for a motorcycle, but it’s also the favorite movie of the owner of this nineT. So Rob and Maarten were compelled to draw inspiration from it. It was clear from the get-go that the modern Beemer needed a brutal and muscular stance. So Smokin’ started by swapping out the tank for a custom-made unit. The design started as a sketch, and then became a 3D CAD render. 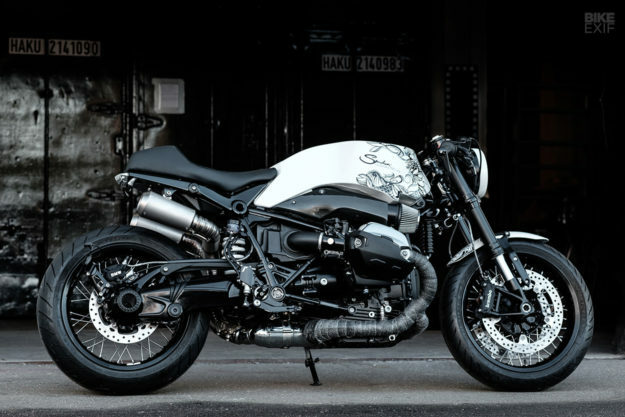 Based off that, Marcel van der Stelt at Custom Factory then produced a one-off aluminum tank. 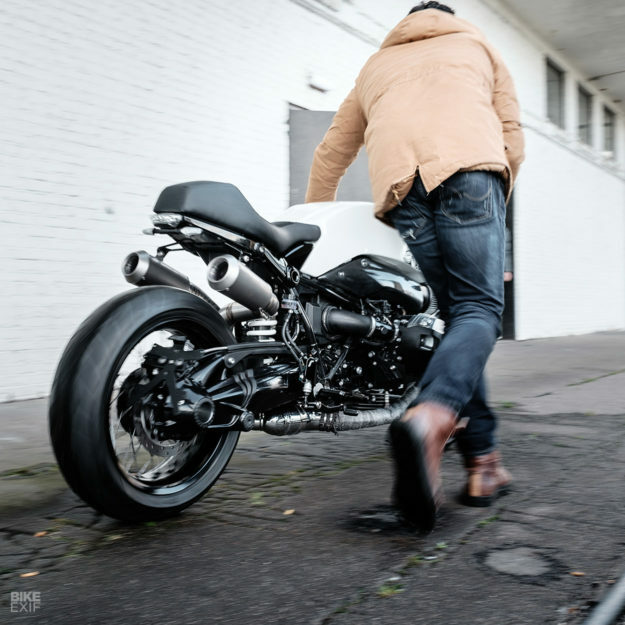 The team cleaned up the tail end of the bike next, by ditching the nineT’s removable passenger support subframe. The cast aluminum side pieces that normally sit under the seat at the tank junction are gone, replaced by a tidier set of black CNC milled ones. It’s created a much cleaner line from tank to tail. 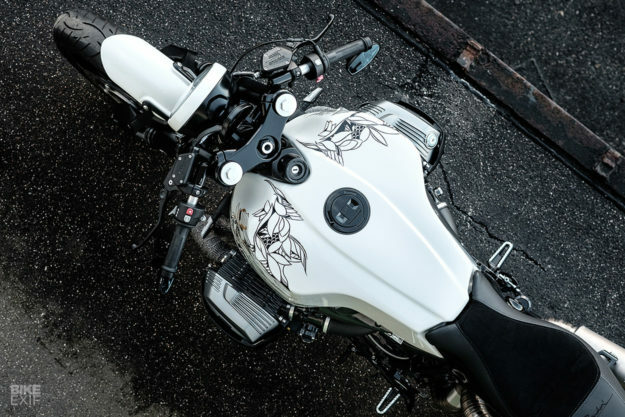 Up top is a custom-made saddle, designed to strike a balance between comfort and cafe racer style. Tijger Leathers handled the upholstery, finishing it with a combo of suede and leather with a Smokin’ logo stitched into it. The BMW’s right-side air duct was ditched too, in favour of a carbon fiber arrangement. Smokin’ also modded the intake to accept a K&N filter up front, for a more aggressive vibe. There’s a carbon throttle valve housing cover on the left side to match things up. There’s a host of small details tying everything together. 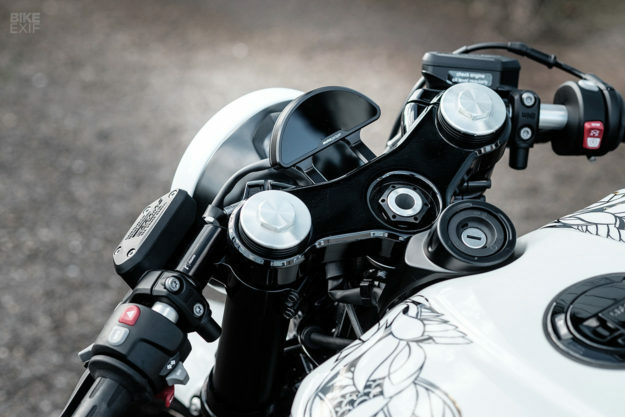 The cockpit features a cleaned up top yoke, clip-ons, and a slim Motogadget speedo. The footpegs, license plate holder, fluid reservoir covers and turn signals are all from the Rizoma catalog. When it came to final finishes, Smokin’ turned to Lisa Ottevanger of Dutch on Wheels for some Japanese-inspired graphics. She laid them down over a crystal pearl white metallic, shot by their painter of choice, Lars. When all was said and done, Lars wrapped it in six layers of crystal clear coat. That sort of consideration is everywhere—like on the front forks, which were stripped, refinished in black and built up again. Little bits like the cylinder head guards, fender brackets and CNC machined exhaust brackets all got the black anodized treatment. 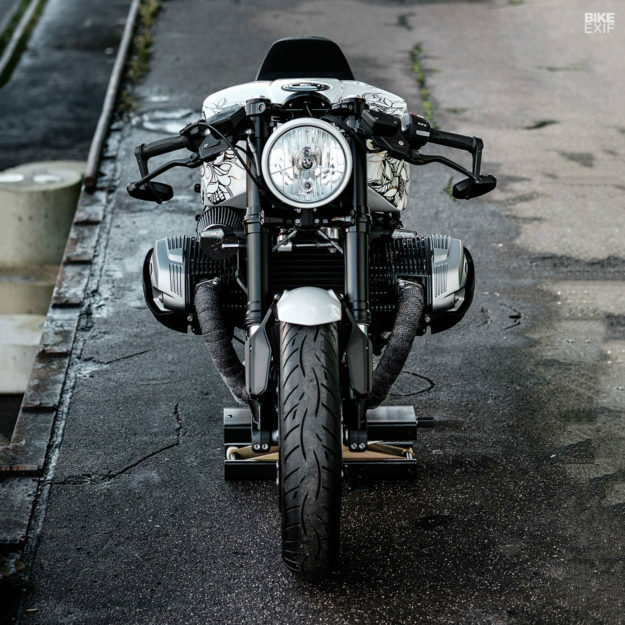 It’s a custom R nineT with the perfect stance and lines, and not an aesthetic hair out of place. It’s an appropriate send-off for this Dutch outfit, and it has us itching to see what Rob and Maarten get up to individually. 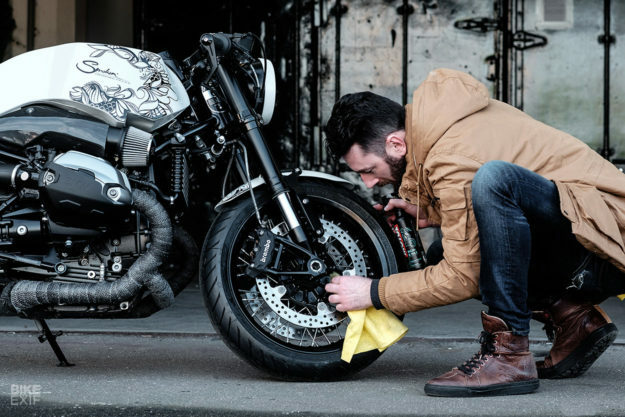 If you’re as curious as we are, keep Robbies Motorcycles and Timmer Motorcycles firmly on your radar. We’ll be watching too.